he Mobile Outreach Van provides services to women who live in places unsuitable for human habitation, such as homeless encampments on the streets, under freeway overpasses, in parks or in their cars. These unsheltered homeless women are in dire need of basic necessities. Good Shepherd Center staff and dedicated volunteers visit these women three times a week in neighborhoods surrounding the downtown Los Angeles area. 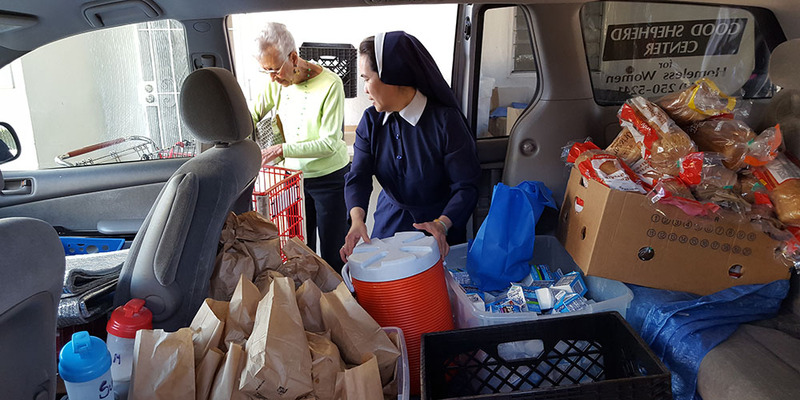 Sr. Rosaline is always in need of food to bring to the women and children living on the streets. Her greatest need is for meats, coffee, cream and sugar. For more information call 213-250-5241.